Sorting data means arranging it in a certain order, often in an array-like data structure. You can use various ordering criteria, common ones being sorting numbers from least to greatest or vice-versa, or sorting strings lexicographically. You can even define your own criteria, and we'll go into practical ways of doing that by the end of this article. If you're interested in how sorting works, we'll cover various algorithms, from inefficient but intuitive solutions, to efficient algorithms which are actually implemented in Java and other languages. There are various sorting algorithms, and they're not all equally efficient. We'll be analyzing their time complexity in order to compare them and see which ones perform the best. Note: This article will not be dealing with concurrent sorting, since it's meant for beginners. Bubble sort works by swapping adjacent elements if they're not in the desired order. This process repeats from the beginning of the array until all elements are in order. We know that all elements are in order when we manage to do the whole iteration without swapping at all - then all elements we compared were in the desired order with their adjacent elements, and by extension, the whole array. 4 2 1 5 3: The first two elements are in the wrong order, so we swap them. 2 4 1 5 3: The second two elements are in the wrong order too, so we swap. 2 1 4 5 3: These two are in the right order, 4 < 5, so we leave them alone. 2 1 4 5 3: Another swap. 2 1 4 3 5: Here's the resulting array after one iteration. Because at least one swap occurred during the first pass (there were actually three), we need to go through the whole array again and repeat the same process. By repeating this process, until no more swaps are made, we'll have a sorted array. The reason this algorithm is called Bubble Sort is because the numbers kind of "bubble up" to the "surface." If you go through our example again, following a particular number (4 is a great example), you'll see it slowly moving to the right during the process. All numbers move to their respective places bit by bit, left to right, like bubbles slowly rising from a body of water. We're going to implement Bubble Sort in a similar way we've laid it out in words. Our function enters a while loop in which it goes through the entire array swapping as needed. When using this algorithm we have to be careful how we state our swap condition. For example, if I had used a[i] >= a[i+1] it could have ended up with an infinite loop, because for equal elements this relation would always be true, and hence always swap them. In the first iteration, 5 will "bubble up to the surface," but the rest of the elements would stay in descending order. We would have to do one iteration for each element except 1, and then another iteration to check that everything is in order, so a total of 5 iterations. Expand this to any array of n elements, and that means you need to do n iterations. Looking at the code, that would mean that our while loop can run the maximum of n times. Each of those n times we're iterating through the whole array (for-loop in the code), meaning the worst case time complexity would be O(n^2). Note: The time complexity would always be O(n^2) if it weren't for the sorted boolean check, which terminates the algorithm if there aren't any swaps within the inner loop - which means that the array is sorted. The idea behind Insertion Sort is dividing the array into the sorted and unsorted subarrays. The sorted part is of length 1 at the beginning and is corresponding to the first (left-most) element in the array. We iterate through the array and during each iteration, we expand the sorted portion of the array by one element. Upon expanding, we place the new element into its proper place within the sorted subarray. We do this by shifting all of the elements to the right until we encounter the first element we don't have to shift. 3 5 7 8 4 2 1 9 6: We take 4 and remember that that's what we need to insert. Since 8 > 4, we shift. 3 5 7 x 8 2 1 9 6: Where the value of x is not of crucial importance, since it will be overwritten immediately (either by 4 if it's its appropriate place or by 7 if we shift). Since 7 > 4, we shift. After this process, the sorted portion was expanded by one element, we now have five rather than four elements. Each iteration does this and by the end we'll have the whole array sorted. Again, we have to look at the worst case scenario for our algorithm, and it will again be the example where the whole array is descending. This is because in each iteration, we'll have to move the whole sorted list by one, which is O(n). We have to do this for each element in every array, which means it's going to be bounded by O(n^2). In each iteration, we assume that the first unsorted element is the minimum and iterate through the rest to see if there's a smaller element. Finding the minimum is O(n) for the length of array because we have to check all of the elements. We have to find the minimum for each element of the array, making the whole process bounded by O(n^2). Merge Sort uses recursion to solve the problem of sorting more efficiently than algorithms previously presented, and in particular it uses a divide and conquer approach. This tree is meant to represent how the recursive calls work. The arrays marked with the down arrow are the ones we call the function for, while we're merging the up arrow ones going back up. So you follow the down arrow to the bottom of the tree, and then go back up and merge. In our example, we have the array 3 5 3 2 1, so we divide it into 3 5 4 and 2 1. To sort them, we further divide them into their components. Once we've reached the bottom, we start merging up and sorting them as we go. The core function works pretty much as laid out in the explanation. We're just passing indexes left and right which are indexes of the left-most and right-most element of the subarray we want to sort. Initially, these should be 0 and array.length-1, depending on implementation. The base of our recursion ensures we exit when we've finished, or when right and left meet each other. We find a midpoint mid, and sort subarrays left and right of it recursively, ultimately merging our solutions. If you remember our tree graphic, you might wonder why don't we create two new smaller arrays and pass them on instead. This is because on really long arrays, this would cause huge memory consumption for something that's essentially unnecessary. To merge the sorted subarrays into one, we'll need to calculate the length of each and make temporary arrays to copy them into, so we could freely change our main array. If we want to derive the complexity of recursive algorithms, we're going to have to get a little bit mathy. The Master Theorem is used to figure out time complexity of recursive algorithms. For non-recursive algorithms, we could usually write the precise time complexity as some sort of an equation, and then we use Big-O Notation to sort them into classes of similarly-behaving algorithms. The equation itself is recursive! In this equation, a tells us how many smaller recursive calls we're dividing our problem into, and b tells us how large is the input of those recursive calls. If T(n) is runtime of the algorithm when sorting an array of the length n, Merge Sort would run twice for arrays that are half the length of the original array. If we apply The Master Theorem, we'll see that our case is the one where a=b^k because we have 2=2^1. That means our complexity is O(nlog n). This is an extremely good time complexity for a sorting algorithm, since it has been proven that an array can't be sorted any faster than O(nlog n). While the version we've showcased is memory-consuming, there are more complex versions of Merge Sort that take up only O(1) space. In addition, the algorithm is extremely easy to parallelize, since recursive calls from one node can be run completely independently from separate branches. While we won't be getting into how and why, as it's beyond the scope of this article, it's worth to keep in mind the pros of using this particular algorithm. To properly understand why Heapsort works, you must first understand the structure it's based on - the heap. We'll be talking in terms of a binary heap specifically, but you can generalize most of this to other heap structures as well. A heap is a tree that satisfies the heap property, which is that for each node, all of its children are in a given relation to it. Additionally, a heap must be almost complete. 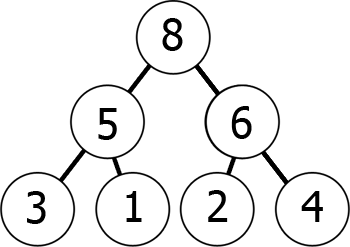 An almost complete binary tree of depth d has a subtree of depth d-1 with the same root that is complete, and in which each node with a left descendent has a complete left subtree. In other words, when adding a node, we always go for the leftmost position in the lowest incomplete level. If the heap is a max-heap, then all of the children are smaller than the parent, and if it's a min-heap all of them are larger. You can envision it as reading from the graph level by level, left to right. What we have achieved by this is that if we take the kth element in the array, its children's positions are 2\*k+1 and 2\*k+2 (assuming the indexing starts at 0). You can check this for yourself. Conversely, for the kth element the parent's position is always (k-1)/2. Knowing this, you can easily "max-heapify" any given array. For each element, check if any of its children are smaller than it. If they are, swap one of them with the parent, and recursively repeat this step with the parent (because the new large element might still be bigger than its other child). 6 1 8 3 5 2 4: Both children are smaller than the parent, so everything stays the same. 6 1 8 3 5 2 4: Because 5 > 1, we swap them. We recursively heapify for 5 now. 6 5 8 3 1 2 4: Both of the children are smaller, so nothing happens. 6 5 8 3 1 2 4: Because 8 > 6, we swap them. 8 5 6 3 1 2 4: We got the heap pictured above! Once we've learned to heapify an array the rest is pretty simple. We swap the root of the heap with the end of the array, and shorten the array by one. And so on, I'm sure you can see the pattern emerging. When we look at the heapify() function, everything seems to be done in O(1), but then there's that pesky recursive call. How many times will that be called, in the worst case scenario? Well, worst-case, it will propagate all the way to the top of the heap. It will do that by jumping to the parent of each node, so around the position i/2. that means it will make at worst log n jumps before it reaches the top, so the complexity is O(log n). Because heapSort() is clearly O(n) due to for-loops iterating through the entire array, this would make the total complexity of Heapsort O(nlog n). Heapsort is an in-place sort, meaning it takes O(1) additional space, as opposed to Merge Sort, but it has some drawbacks as well, such as being difficult to parallelize. Quicksort is another Divide and Conquer algorithm. It picks one element of an array as the pivot and sorts all of the other elements around it, for example smaller elements to the left, and larger to the right. This guarantees that the pivot is in its proper place after the process. Then the algorithm recursively does the same for the left and right portions of the array. This turns out to be O(n^2). This may sound bad, as we have already learned multiple algorithms which run in O(nlog n) time as their worst case, but Quicksort is actually very widely used. This is because it has a really good average runtime, also bounded by O(nlog n), and is very efficient for a large portion of possible inputs. One of the reasons it is preferred to Merge Sort is that it doesn't take any extra space, all of the sorting is done in-place, and there's no expensive allocation and deallocation calls. That all being said, it's often useful to run all of these algorithms on your machine a few times to get an idea of how they perform. They'll perform differently with different collections that are being sorted of course, but even with that in mind, you should be able to notice some trends. We can evidently see that Bubble Sort is the worst when it comes to performance. Avoid using it in production if you can't guarantee that it'll handle only small collections and it won't stall the application. HeapSort and QuickSort are the best performance-wise. Although they're outputting similar results, QuickSort tends to be a bit better and more consistent - which checks out. If you have your own types, it may get cumbersome implementing a separate sorting algorithm for each one. That's why Java provides an interface allowing you to use Collections.sort() on your own classes. To do this, your class must implement the Comparable<T> interface, where T is your type, and override a method called .compareTo(). This method returns a negative integer if this is smaller than the argument element, 0 if they're equal, and a positive integer if this is greater. In our example, we've made a class Student, and each student is identified by an id and a year they started their studies. We might want to sort our objects in an unorthodox way for a specific purpose, but we don't want to implement that as the default behavior of our class, or we might be sorting a collection of an built-in type in a non-default way. Collection.sort() works by calling the underlying Arrays.sort() method, while the sorting itself uses Insertion Sort for arrays shorter than 7, and Quicksort for the rest. It's based on a specific two-pivot implementation of Quicksort which ensures it avoids most of the typical causes of degradation into quadratic performance, according to the JDK10 documentation. Sorting is a very common operation with datasets, whether it is to analyze them further, speed up search by using more efficient algorithms that rely on the data being sorted, filter data, etc. Sorting is supported by many languages and the interfaces often obscure what's actually happening to the programmer. While this abstraction is welcome and necessary for effective work, it can sometimes be deadly for efficiency, and it's good to know how to implement various algorithms and be familiar with their pros and cons, as well as how to easily access built-in implementations.